The last day of Ratha Yatra (Ashadha trayodashi tithi) also called the ‘Neeladri Vije’, is commemorated as “Rasagola Dibasa” in Odisha the birth place of the dessert. This 700-year-old sweet dish was part of a ritual. The legend goes that Lord Jagannath offered the sweets to his consort Lakshmi, to pacify her for not being taken along during the Ratha Yatra or ritual chariot ride. Rasagola Known as ‘khira mohana’ due to its almost white appearance back in the 11th century, it thus became customary to offer this chenna sweet dish to Goddess Mahalakshmi as prasad, especially on the ‘Neeladri Vije’. 500 years old Odia literature – ‘Dandee Ramayana’ proves that Rasagola existed in Odisha popularly enough to be mentioned in the texts. The ‘Dandee Ramayana’ edited by Pandit Gobinda Rath published by Nityananda Pustakalaya, Balubazaar in Cuttack clearly mentions the word rasagola in its page number 76. Odisha’s rasagola is brownish as it is preapared using Jaggery. On the contrary Bengal rasagola is white being made using sugar. The fact that Jaggery is precursor of Sugar clearly implies that Odia rasagola is the forefather of Bengali rasagola. 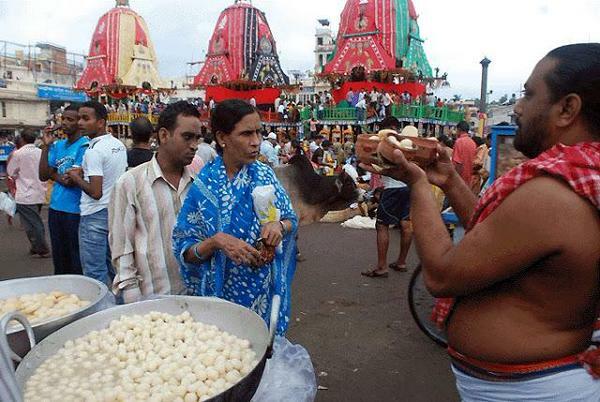 There was use of Rasagola as Kheeramohana since last 700 years during Niladri Bije ritual of Lord Jagannath just after the Bahuda Yatra. Known as Chenamunda 400 years before even it surfaced in Kolkata. The non-mention of this item in the sweets of Kalipuja occasion in Meladarshan of 1884 indicates that it was not invented by the Bengalis in 1868. 1884 Calcutta fair visited by Lord Ripon, the then British Viceroy of India lacked the presence of the sweet among others popular items presented by Bengalis. Not to forget that a part of Odisha was also in the Bengal presidency then. 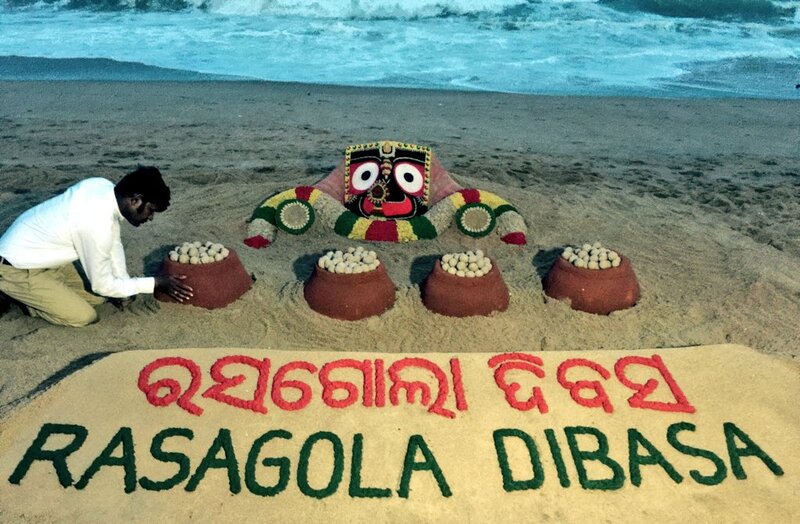 Popularity of Rasagola in Odisha was evident in the spectacular occasion of Bali Jatra of Cuttack in 1893 judged from the poem Balijatra of Damodar Pattnaik of Dhenkanal. In the traditional Odia texts like Madalapanji and Deshkhanja of Odisha we find the terms like Rasakora, Chhenaladu and Chhenamanda, and as Rasagola. From Purnachandra Odia Bhashakosh a referenence states- Sankalpara Manda Hela Satya Rasagola. It suggests indirectly that Rasagola originated from Chhenamanda. In the Bangiya Biswakosh of Nagendranath Vasu published in the last decade of 19th century the term Rasagola was described as simply Deshaja (there was no indication of its Bengal origin in it). 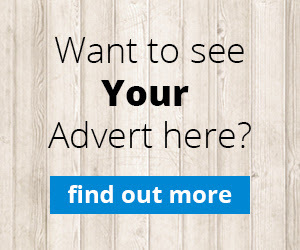 Why in Bengali Biswakosh the term is not stated as a Bengali noun because the reference Deshaja may also indicate both Odia and Bengali. Another ancient text Premapanchamruta of Bhupati also mentions cheese (Chhena). To disprove the Niladri vije rituals some Bengalis pleaded that Indians did not know how to prepare cheese and later learned it from Portuguese and that cheese being a rotten form of milk is never offer it to God. These two statements are false and deceitful because cheese (आमिक्षा) has been mentioned several times as Yajnic offerings in Vedic ritual texts. Famous British chef William Harold has described it in a journal – “a bowl of sweet, syrupy, soft cheese balls.” Odisha has largest number of varieties of Rasagolas. the taste varies in place to place. the sweet spots of odisha are Puri, Neelagiri, Bhubaneswar, Cuttack, Pahala, Salepur and Govindpur. Bikala Kar is a very popular confectioner from Salepur, Cuttack. They were the founder of “Kar & Brother” who actually popularized the Rasagolas. The rasagolas made by the descendants are considered to be the best rasagolas in the state. They are also popularly known as “Bikala Kar Rasagola”. Pahala Rasagola dates back as a popular road side public business from as old as 100 years. Rasabara made up of Muga is a prasad in Nuakhai festifal having history of more than 700 years. Rasbara, Rasmalai, Rasfeni (now: feni), Rasabali and Raskadam names for sweets are still used. rastula – a village in balngir district of odisha where traditional sweet makers (gudias) makes rasagolas. Literatures like Raskallol, Ras binodini are also included the word ras. So ‘Ras’ word is a native to odisha. Thus rasagola originated in Odisha but centuries later got merely modified in Bengal. With Inputs from researcher Dr Kailash Chandra Dash (Berhampur), Dr Devasisa Jethy and other sources. Rasagola Dibasa : Here is a list of sources which point to the Origin of Rasagola in Odisha, how many did you know before? ← Rasagola Dibasa : Here is a list of sources which point to the Origin of Rasagola in Odisha, how many did you know before?